In Texas, thousands of workers are injured on the job each year. Many of those injuries occur due to on-the-job car accidents. If you suffered a car accident while driving for work, you might be entitled to compensation for your injuries. At Sutliff & Stout, we represent injured employees and are anxious to speak with you about your options. Does Worker’s Compensation Cover Car Accident Injuries at Work? Car accidents can cause devastating physical and emotional injuries that require thousands of dollars in treatment. After a car accident, you might be entitled to money damages for all of your economic and non-economic losses. Injured workers can estimate the amount they can receive by keeping their medical bills and receipts. Add up the amount. You can generally receive 100% of the amounts spent on these costs. Other economic losses include lost wages if you could not return to work while you recovered, as well as any damage to your property (such as your car). Find pay stubs, W-2 forms, and repair estimates to calculate the amount of these losses. Although these losses are harder to calculate in monetary terms, an experienced car accident lawyer can estimate the amount you might receive. Generally, the more serious your physical injuries, the more you can receive for non-economic losses. For example, someone permanently disabled can usually receive much more than someone who suffered whiplash. Call the police. A police officer should come out to the accident scene and create a police report, which will identify the parties involved in the collision. The officer will take down each side’s story and make a preliminary determination of fault. The police report is not the final word on what happened, but it is a great place to start your own investigation. It can establish important baseline information, such as the location of the crash as well as the time and date. Exchange insurance information. You want the other driver’s name, insurance card, and license plate number. Get this information as soon as possible. If the other person was also an employee, ask for information about their employer. Tend to any injuries. You might not feel immediate pain after a minor fender-bender. Conversely, a serious crash could leave you in debilitating pain. If you are bleeding, try to stop the bleeding by applying pressure using a towel or other cloth. Call emergency services or ask someone who is not injured to call them. Take pictures of the accident scene. It is impossible to reconstruct what actually happened during the collision several months later. However, pictures taken right after a crash are very important pieces of information. Document where the vehicles ended up, as well as any skid marks on the road. If you think an obstruction contributed to the crash, such as a tree branch in front of a stop sign, then take a picture of that as well. If you are too injured to move, ask a bystander to take these pictures for you. You can use your smartphone. Get the names of witnesses. The police officer might have written down the names in the police report, but you should try to get names yourself. Write down their contact information, such as phone or email address. Since people switch jobs so often, get home contact information instead of work contact information. Your car accident lawyer might want to talk to any witnesses. Since you were injured on the job, you also need to notify your employer of the injury. Texas workers’ compensation rules mandate that injured employees file an injury report within 30 days of the injury. If you wait too long, then you can lose out on the ability to receive workers’ compensation benefits. The best course of action is to notify your employer as soon as possible. Don’t apologize for the accident. Nothing is more human than saying, “I’m sorry” after an accident. Many people apologize even when they know they are not at fault. However, all motorists need to know that any admission of responsibility can be used against them later on. Even something innocent like, “I didn’t even see you!” could be used to show you were not paying attention while driving. Don’t minimize your injuries. After the crash, the other motorist might ask if you are okay. Although you might feel fine, the truth is that many injuries are slow to develop after an accident. Back injuries, traumatic brain injuries, and sprains or strains might take a day or two before you fully comprehend the severity of your pain. If you immediately say you feel “fine,” then the other motorist could argue that you are making up your injuries. Avoid self-diagnosing your injuries. Some people fear the doctor. You might think you know what is wrong with you, but you absolutely should visit the doctor and follow his or her advice. If you do not think you are improving, then get a second medical opinion. Do not rely on your own online research to diagnose what is wrong with you. The defendant could argue you have made your injuries worse because you did not follow medical advice. Avoid taking a quick settlement. Some insurers might reach out to you soon after the accident and dangle a settlement offer in front of you. Chances are, the insurance agent is offering far less money than your injuries are actually worth. Remember that every settlement comes with an important string attached—that you give up the opportunity to sue the defendant in the future for more compensation. This means the paltry sum you settle for will be all the compensation you receive. Politely decline any initial settlement. Never talk to an insurance adjuster without an attorney. An insurance adjuster might try to get you to say something you shouldn’t. By meeting with an attorney, you can protect your rights to compensation after a car accident while on the job. Based on our experience, motorists who avoid making these mistakes increase their chances of receiving a favorable settlement. Workers injured in a car accident while on the clock have two potential sources of compensation: the other driver and workers’ compensation benefits. In some situations, you might be able to receive compensation from both sources. If you can prove that the other driver is responsible, you can make a claim with their insurance company. All Texas drivers should have proof of financial responsibility. Most drivers will meet this requirement by carrying automobile liability insurance, typically with at least $30,000 in liability insurance. You might also qualify for workers’ compensation benefits. Workers’ comp is not required in Texas, though many large employers have it. Workers’ compensation benefits are available if you were injured in the “course and scope” of employment. This means that you were advancing your employer’s interests and you were under your employer’s control when the accident happened. Workers’ compensation benefits are “no fault,” meaning it does not matter if you were responsible for the crash. You qualify so long as you were injured on the job. Often, injured motorists contact us because they got into a car accident while driving to work or driving home. Typically, in these situations, you are not injured in the “course and scope” of your employment. Instead, you are off the clock and therefore not under your employer’s control. However, you might qualify if you were driving to a meeting as part of your job or visiting a client on your employer’s behalf. Because it is not always clear whether you qualify for workers’ comp benefits, you should meet with an attorney right away to review the surrounding circumstances. Some companies provide their employees with vehicles. If you suffered a car accident in a company vehicle, then the analysis is the same as above: you might be able to sue another motorist if they were at fault for the accident. You will need to show that they were negligent or reckless. However, you probably also qualify for workers’ compensation benefits even if you were traveling to and from work. By being in the company car, you might come under the state’s workers’ compensation system. Does Workers’ Compensation Cover Car Accident Injuries at Work? Yes. As discussed above, workers’ compensation will pay out benefits if you were injured in the course and scope of employment. Workers’ compensation benefits, however, are relatively meager. Those injured in a workers’ comp car accident will receive necessary medical care and a portion of any lost wages. However, injured workers cannot receive pain and suffering or other intangible injuries, like emotional distress. They also will not receive full reimbursement for lost wages. The major benefit of workers’ compensation benefits is that they are no fault, which means injured employees can receive compensation if they caused the collision. In this situation, you cannot sue another motorist, unless they were also at fault—so workers’ compensation can be an important source of benefits, depending on the circumstances surrounding your crash. If you obtain workers’ compensation benefits and legal damages from an at-fault driver, then you should realize that the workers’ comp insurer will want to be reimbursed for any sums spent on medical care and disability benefits. 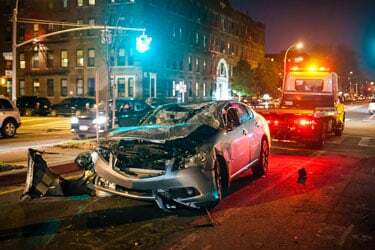 This is called a “right of subrogation,” which you can talk about with your car accident lawyer. Of course, the true benefit of bringing a lawsuit is to receive compensation for pain and suffering, mental anguish, and other non-economic losses. These can be substantial, especially in devastating crashes that leave people impaired permanently or for a very long time. Some injured motorists think they can negotiate an effective settlement on their own. Although there are some areas of law where people don’t need an attorney, this is not one of them. Instead, you need an experienced accident attorney who can maximize the amount of money you receive from the at-fault driver and their insurer. Locating all relevant insurance policies. Some drivers might have more than one insurance policy that will cover a car accident. Identifying all policies can substantially increase the amount of compensation available for your settlement. Suing all defendants. More than one person might be responsible for the crash. As your attorney, we will identify all parties who contributed to the collision. For example, if a delivery driver struck you, we can sue not only the driver but also the delivery company, which has much deeper pockets. If a car defect contributed to the crash, we can sue the manufacturer of the car or defective component part. These companies likewise should have more money at their disposal to pay out a settlement. Minimizing your own fault. In Texas, the amount an injured motorist can receive will be reduced by their own contributory negligence. For example, someone might have rear-ended you because you failed to use a turn signal, or you might have aggravated your injuries by not following your doctor’s advice. The amount you can receive will be reduced by your percentage of fault. Furthermore, you will probably not receive anything if you were more than 50% responsible for the collision. Motorists who are 51% responsible cannot receive compensation in a lawsuit, so you should not expect an insurance company to offer a settlement if you were more responsible for the crash, either. Documenting your pain and suffering. Economic losses like lost wages or medical expenses are easy to calculate because there is a bill or pay stub attached. However, intangible harms like pain and suffering are subjective, which means this is where your attorney can prove his or her worth. At Sutliff & Stout, we can help you fully document these non-economic losses. Seeking punitive damages, where appropriate. Texas law allows juries to punish defendants for particularly bad behavior. If a defendant intentionally harms you or is grossly negligent, then you can seek punitive damages, also called exemplary damages. These damages can be substantial, and you receive them in addition to your other damages. Finally, we have been in the car accident business a long time. We have negotiated with nearly all of the state’s largest insurers and understand what tricks insurance companies use to try and minimize claims. We never leave a stone unturned but marshal all of the facts in your favor. By hiring us, you signal to insurance companies that you are serious about getting the compensation you deserve and will not be bullied. If you have been involved in a car accident at work, we want to hear from you. Sutliff & Stout have obtained numerous six and seven-figure settlements and jury awards for our clients, and we want to use our experience to help you, too. To speak with one of our car accident lawyers, please schedule your free consultation with us today.